For many individuals, this summer will be full of fun, enjoying the great outdoors and spending time with friends and family. Oh, and of course many hours of surfing the Internet. Online surfing is a great opportunity to shop, chat with friends and catch up on the latest news – and you don’t even have to be near a beach. However, dangers still lurk and we want to help you avoid being the victim of an online attack. 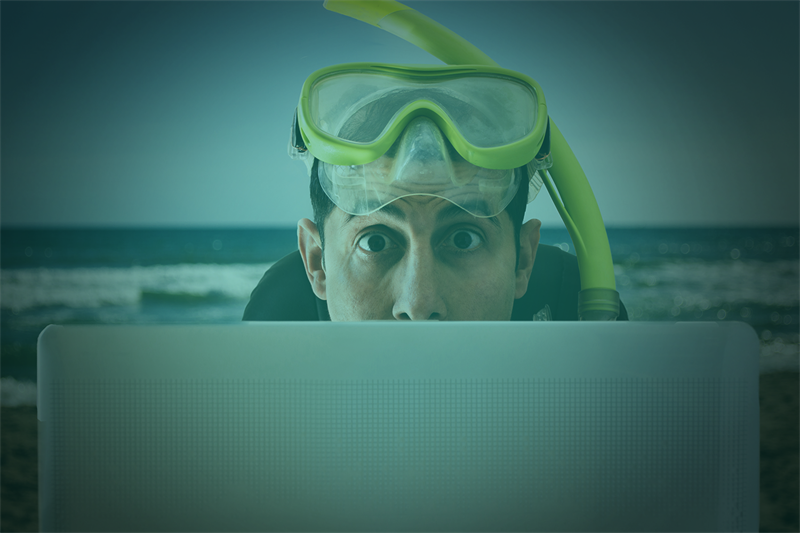 As we head into warmer weather, below are some quick tips you can share with employees, family and friends to keep them out of harm’s way while surfing the web this summer. Avoid Nasty Phish Bites – Phishing emails are hoaxes that try to get their prey to click on malicious links or open attachments. The last thing you want to do is get bit by a dangerous phish. If the email looks suspicious in any way, chances are it’s a phishing attack. Common phishing emails include attachments, unidentifiable links, requests for account login info and content out of the ordinary from the recipient. Use Scam-Screen Protection – Scammers are relentless at finding vulnerabilities with their prey. Avoid social media requests and online conversations altogether from people you don’t know. If a friend or family member asks for something unusual, like $5,000 to get them home from overseas, it’s a good chance their account has been hacked. If this does happen, contact your friend or family via phone to verify if they truly need help. You can at least help by notifying them that their social media account is compromised so they can fix it. Obey Browsing Red Flags – Flags are typically flown by lifeguards on beaches to let surfers know of safety hazards. The same is true for online surfers. There are many online flags that should always be adhered to when browsing online. Flags include popups, unsecure webpages that ask you to login or provide personally identifiable information (PII), URL’s that don’t look legitimate and any site that asks you to download something you are not expecting. If any of these appear, run away fast to avoid having your information stolen or installing malicious software on your device. Access the Wi-Fi Beach Safely – Scammers love finding prey by providing free and dangerous places for online surfers to swim. They also make the Wi-Fi connection look legitimate. If you are connecting to an unknown Wi-Fi network, speak with an employee of the coffee shop or establishment to ensure you are connecting to a legitimate connection. For additional safety, if connecting to a public Wi-Fi, never conduct online activities such as banking or investing. Unsecured networks may allow attackers access to copy your login details and use it later to steal information or money from your accounts. Be a Lifeguard – Many individuals just look after themselves, while others keep a watchful eye on hazards to help keep surfers safe. Play an active role in helping your friends and family surf online safely. The best rewards in life are when you make a difference by saving others. At Optiv, we want all employees, family and friends to enjoy online surfing in a fun and safe environment. Please share this information so together, we can defeat unwanted threats.